Hoosier cyclists (and Wolverines making trips in Indiana) are taking to the road in a new commuting competition. You can earn bragging rights and win cool stuff by registering for the Challenge, “riding your drive” and logging your miles at www.BicycleIndiana.org. An eligible “trip” is any ride that replaces an automobile trip (in other words, one in which you “ride your drive”). Cyclists can compete individually and/or as part of a team for honors in the top mileage and most commuter trip categories. The Competition started July 1, but it’s not too late to sign up and join in the fun. If you know the trips and mileage you have done since July 1, enter those miles retroactively. The contest ends on Sept. 30. While you don’t have to be on a team to participate, if you select Bike Michiana as your team and allow your mileage/trips to count in with others, Michiana cycling efforts are more likely to be recognized. Bicycle Indiana will award prizes to the top three individual mileage and trip achievements and to the top club/group for mileage and trips. The top teams will win a “virtual trophy” that will remain on Bicycle Indiana’s Web site for one year. Club/group winners will be determined by the combined mileage or trips of the overall club/group members and not the registered competitors. For the competition, a trip is defined as one leg of a ride. For example, a ride to work and back home is considered two trips; a ride to the store, then to dinner and then back home would count as three trips. For more information and to register, visit Commuter Challenge. South Bend is a Bronze Level Bicycle Friendly Community. Goshen is an Honorable Mention Bicycle Friendly Community. 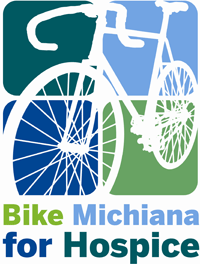 I encourage everyone to join the Bike Michiana team to show that we deserve those awards. Bike Michiana for Hospice will be held Sunday, September 11th at St. Patrick’s County Park, South Bend, IN. Participants can register online at bikemichianaforhospice.org. The cost for riders who register before August 31 is $30; beginning September 1, the registration fee is $40. Riders 12 and under ride free. The ride features scenic routes through country roads, live entertainment at each support and guidance (SAG) stop as well as a post-ride party at St. Patrick’s County Park with pulled pork, live music and a beer tent. Courses include a 3.5 to 11.5 mile family ride (riders can choose the distance) as well as longer rides from 25 miles to 200 K (124 miles). Helmets are required for all riders. SAG stops will feature some of the area’s leading restaurants including Fiddler’s Hearth, LaSalle Grill, Indulgence Pastry Shop & Cafe, Yesterday’s and Grande Mere Inn. Registration proceeds benefit The Hospice Foundation and Bike Michiana Coalition. Riders may also use an online donation form to raise funds for The Hospice Foundation. One hundred percent of those funds will go to support the Center for Hospice Care’s mission to provide quality, compassionate care for anyone in need of hospice or palliative care services, regardless of their ability to pay. The information and text for this post were provided by Debra Mayfield, and she can be contacted at 800-413-9083 for more information regarding the event or registration. Ruth Billings set out for her 50th Central High School reunion on Memorial Day, May 30, from Fort Collins, Colorado and arrived in South Bend, Indiana on June 23, some 1106 miles later. The 67 year old rode her bike alone pedaling about 60 miles per day. She reports she never felt unsafe or worried about others. She called a friend each night, who had a list of Ruth’s motel destinations, to report her progress and her whereabouts. She wore a reflective vest to be as visible as possible. Inspired by an article in Adventure Cycling magazine about a woman doing a similar trip, she decided to attempt the same. She planned her route each day, as she traveled, using maps of trails and bikeways for the most part. At times she rode on highways with clean wide shoulders and on back roads as well from Colorado, through Nebraska, Iowa, Wisconsin, and Michigan and into Indiana. When she got to Wisconsin she followed bike paths to Lake Michigan. She rode the 40 miles of “Military Ridge” trail to Madison and followed several more paths, the “Glacial Drumlin,” the “New Berlin” trail and on to Milwaukee. There she rode the ferry across Lake Michigan to Muskegon, and continued on along Michigan’s Lake Shore into Indiana. Much of the Lake Shore was familiar from days spent at Lake Michigan as a child. Ruth was welcomed with admiration and awe at her High School reunion and fielded many questions about her adventure. Of course, she was awarded the longest distance anyone rode on a bike to the event. She was without competition. This probably will not be her last adventure. The 2011 YWCA run, jane, run Bike for Women is scheduled for Sunday, August 21st. There will be two rides, one twenty and the other forty miles. All rides start at St. Patrick’s County Park between 8:00 and 10:00 a.m. Please visit the YWCA event page to register and for the latest information.